After getting rather tipsy at The Frog and Princesse, Mr Frog and I went to Les Deux Magots, a café reputed for having the best hot chocolate in Paris. After my experience at Café de la Paix, I was interested to see whether Les Deux Magots could deliver. We arrived around midnight and were greeted by an older, portly man in a black, three-piece suit with a white shirt and a silky bow-tie, who instructed us to sit “anywhere”. At this time on a Wednesday, there were only two other occupied tables. As we waited for our hot chocolate, I looked around the room. The café is brightly lit with rows of red leather booths bordered by white pillars. 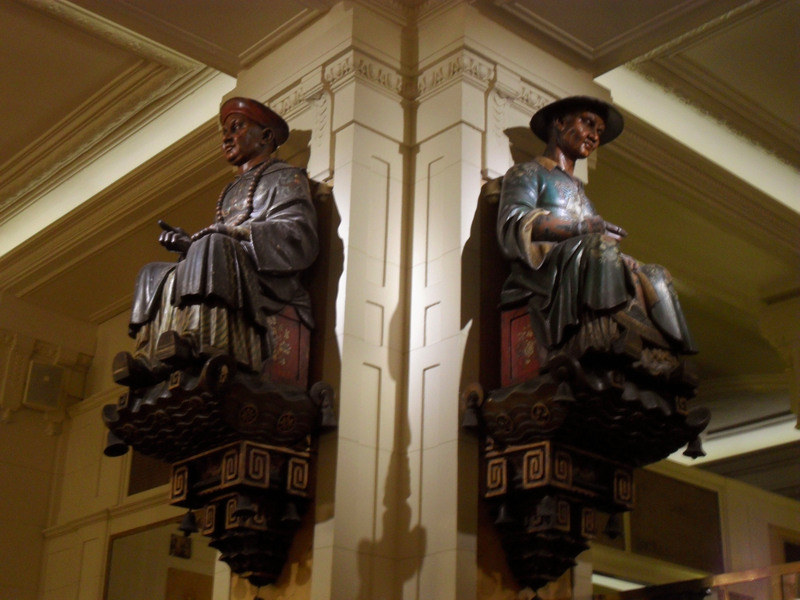 At the top of one of the central pillar sit Les Deux Magots, two Asian statues which have been there for over a century. 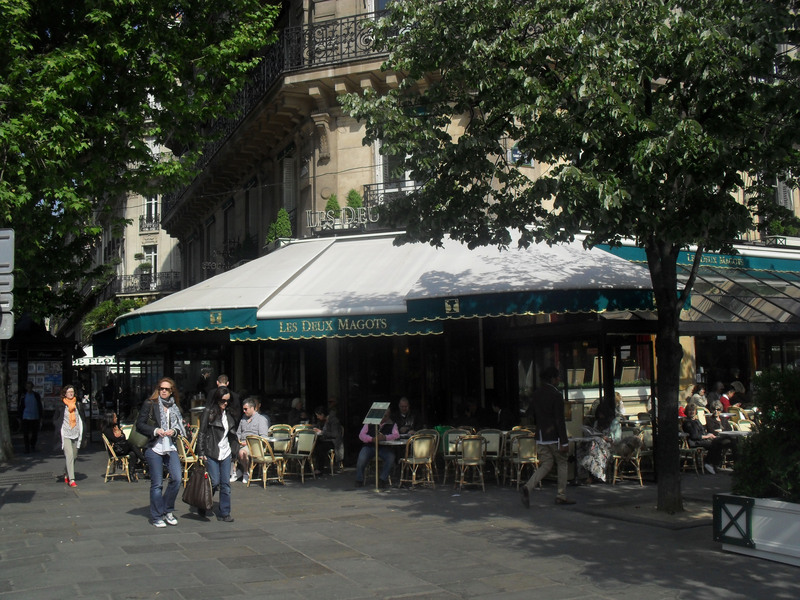 After starting as a drapery in 1813, then becoming a wine merchants by 1884, Les Deux Magots was refurbished and transformed into a café in 1914, and it became a haunt of many figures of the literary world – from Oscar Wilde to Ernest Hemmingway to moi! Mr Frog was cruelly forcing me to speak in French when our chocolats chauds arrived. Our waiter lowered a tray holding two tea cups, two glasses of water, and a large china jug of hot chocolate. I poured and inhaled, trying not to swoon as the chocolate oozed into my cup. I stirred it with my spoon and, like oil, the liquid held the pattern of the swirl as I took my first sip. The chocolate invaded my mouth, clinging to every surface. I suddenly found myself thinking of my childhood Easters, when I would break up my largest Easter eggs in the same bowl and devour them, piece by piece, over the coming weeks. It tasted like I held melted them all and was drinking the result straight from the bowl. This beverage wasn’t like the milky concoctions you find at Starbucks – it was pure liquid chocolate. Fondue. So, which chocolat chaud was better? It’s hard to say – they both had the same gooey texture, and rested on the back of my teaspoon rather than dripping off. Although they were both intense, the chocolate at Café de la Paix was darker – I needed two glasses of water to get through it. At Les Deux Magots, I easily managed with one. And I still think the hot chocolate at Café de la Paix would go very well over vanilla ice-cream, whereas I wouldn’t dream of diluting the one at Les Deux Magots with anything. I suppose it depends on what you’re looking for – Café de la Paix was much larger and luxurious, and Les Deux Magots was more intimate. The service was more attentive at Café de la Paix, though that could have been due to the late hour at which we visited Les Deux Magots. And, at €7, Les Deux Magots is slightly better value for money. Let’s just say I’d be happy to try them both again.